Sunday. 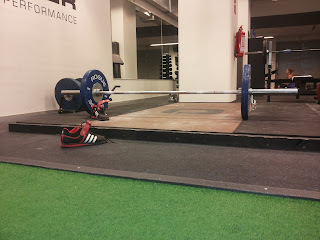 Metcon, 3rds of: 20 hspu, 20 pistol, 20 hang power clean (60kg). Time, 14.09. This time the weather was not as tempting so we hit the gym at noon for a workout. We had some errands to take care of so it was a max one hour session. It was supposed to be squats plus this metcon but I realized there would not be enough time to focus well on both workouts. I was really looking for the metcon so it was an easy choice. I wanted to breath heavy. Not the easiest setup. The nature of all three elements change radically when you do them for multiple reps per round. Had it been 7-7-7 or 20-20-20 it's a bit of a different thing. The one I was a bit anxious about was hspu's. How would my body react to sets of 20 reps. Last time I did such high volume sets was one year ago in Spain's cf affiliate, and that workout murdered me. This time I survived much better. First round unbroken without any problems. The following rounds were about 10-5-5 reps. Pistols were 8-4-4-4 each round. Kept a short break to loose the tension in my legs. Those were better than I thought too. I took one rep each leg for warm-up so it wasn't obvious how they would turn out to. Cleans were from hang position, and the first round was 10-5-5, second round was probably similar, and on the last round I decided to step up my game my doing 10-10 reps to finish the workout in 14.09. This was an awesome workout, liked it very much! Being able to keep moving despite the fact there was 20 reps of each movement was simply great!